In 2011, senior Christian radio host Harold Camping made national headlines when he predicted with absolute confidence that come May 21st of that year, Jesus was going to return and rapture the saved into heaven. Michael Drosnin, author of the bestselling book The Bible Code, claims that his complex word-search of scripture reveals a date for World War III in the year 2000. In the late 1980s, Former NASA engineer Edgar Whisenant authored a book entitled 88 Reasons Why the Rapture Will Be in 1988. Circulated by the millions, it made the case that the rapture would occur sometime between September 11th and September 13th. In 1987 one by the name of Dr. Leland Jensen proclaimed that Halley’s Comet was going to be the end of us all. When the destruction failed to occur he argued that it was had been a spiritual impact. In his bestselling work of the 1970s, The Late Great Planet Earth, Hal Lindsey predicted that the end-time prophecies of the bible of war and famine were being fulfilled in today’s time, and that by the late 1980s the world would be engulfed in a nuclear armageddon that would bring out Christ’s return. Shortly after President Truman’s announcement of the first Soviet atomic test, a young Billy Graham proclaimed that we only have another couple years at most until Jesus returns, saying, “We may have another year, maybe two years to work for Jesus Christ, and [then] ladies and gentlemen, I believe it is all going to be over…Two years, and it’s all going to be over.” In 1952, as the end of the designated two years approached, he was still insisting: “Unless this nation turns to Christ with the next few months, I despair of its future.’” Graham has been pushing for an imminent doomsday ever since. Pastor Charles Taze Russell, forerunner of the Jehovah’s Witnesses, claimed that Jesus’ invisible rulership began in 1874 and that the world’s end will arrive in 1914. Halley’s Comet returned in 1914 caused massive panic for the end, to the point where some were buying “comet pills” to protect themselves. Even crazier were member of an Oklahoma sect known as the Select Followers, who attempted to sacrifice a virgin to appease the comet. Fortunately she was saved by law enforcement who had gotten wind of the plan. What became historically known as the Great Disappointment, baptist William Miller interpreted passages from the Book of Daniel to proclaim that Jesus would return between March 21st, 1843 and March 21st, 1844. When the deadline passed, devoted followers extended the day to October 22nd, 1844. Like those who came before and after them, the Millerites quit their jobs and sold their possessions during what believed to be their final weeks. Joseph Smith, founder of the Mormon faith, wrote that one day he was praying for God to reveal to him the time of the Second Coming when he heard a voice telling him that he won’t see it occur until he reached the age of eighty-five. As some of you know, Smith was murdered by a mob in 1844. Here’s a fun one. In 1806 villagers in Leeds, England were convinced that doomsday had arrived after a hen had laid prophetic eggs with the inscription “Christ is coming.” It turned out to be a hoax by esteemed fortune teller Mary Bateman, who had written on the eggs with acid and reinserted them into the hen. In a letter to his monarchs, famed adventurer Christopher Columbus predicted that he was on a mission from God to convert the pagans in Asia and that fulfilling this deed would result in the end of the world in 1656. Martin Luther, the father of the Protestantism, once wrote, “I hope the last Day of Judgment is not far, I persuade myself verily it will not be absent full three hundred years longer.” Writing around 1540, Luther set a time limit for no later than 1840. 1284 marked the 666th anniversary of the rise of Islam, convincing Pope Innocent III that it was this year civilization would witness the Second Coming. 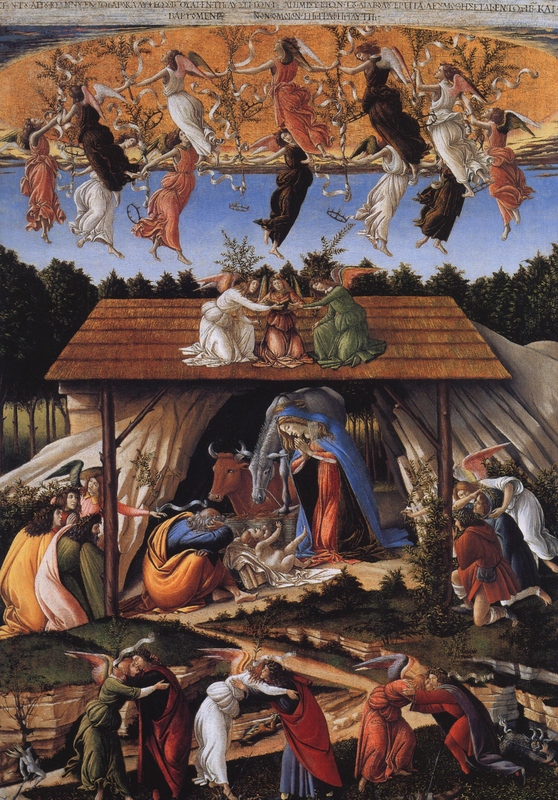 Italian Renaissance master Sandro Botticelli (1265-1321) believed he was living during the Tribulation and has only three-and-a-half years before the end, as conveyed in an inscription above his painting The Mystical Nativity, which depicts several devils being bound under the earth symbolizing the future binding of the devil and his minions. Abbot Joachim of Fiore, who, after a series of visions, prophesied that the end would be arriving very shortly. After his death, his followers specified his apocalyptic message to an end date of 1260. Forget Y2K. Y1K threw many into absolute panic for an expected doomsday, including Pope Sylvester II. Notable theologians Sextus Julius Africanus, Hippolytus, and Irenaeus, believed the Second Coming would arrive in 500 CE.